These cupcakes can be frosted in either vanilla or chocolate butter cream frosting and decorated with confetti or colored sprinkles. Rich chocolate; slightly more dense in texture when compared to vanilla. Vanilla; Spongy and moist; baked with confetti. Spongy and moist; baked with lemon juice and zest. Spongy and moist; flavored with almond extract. Moist cupcake, enhanced with almond extract; frosted with either vanilla or chocolate frosting and topped with almond brittle and drizzles of chocolate ganache. Dense, old fashioned cupcake that contains carrots, walnuts, and coconut; frosted with cream cheese butter cream and sprinkled with toasted walnuts. Chocolate cupcake baked with toasted, ground hazelnuts; frosted with a swirl of dark chocolate and hazelnut ganache and sprinkled with ground hazelnuts. Chocolate cupcake; frosted with chocolate peanut butter frosting and topped with chopped reese’s peanut butter cups then drizzled with a peanut butter sauce. White cupcake baked with flaked coconut; frosted with coconut flavored butter cream frosting. Chocolate cupcake; frosted with German chocolate frosting made with coconut, caramel & pecans. Vanilla cupcake with toasted hazelnuts; frosted with vanilla or chocolate butter cream frosting and sprinkled with chopped hazelnuts. Cupcakes should be stored in the refrigerator and brought to room temperature for a minimum of 30 minutes prior to serving in order to reach peak flavor. Cupcakes that are frosted in whipped cream or cream cheese frosting are not recommended to be displayed in outdoor events due to temperature sensitivity. Use butter cream frosting as an alternate option. Spice cupcake filled with fresh apple mousse; Frosted with butter cream, lightly flavored with cinnamon & drizzled with caramel. Vanilla cupcake with vanilla custard filling; frosted with chocolate ganache glaze and decorated with chocolate. Chocolate cupcake with whipped chocolate ganache filling; frosted with salted caramel butter cream, then drizzled with caramel, chocolate sauce, and a sprinkle of sea salt. Brown sugar cupcake with cookie dough filling and frosting. Sprinkled with mini chocolate chips and topped with a mini chocolate chip cookie. 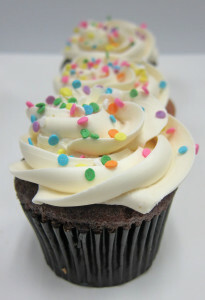 Chocolate cupcake with cookies & cream mousse filling; frosted with fresh whipped cream and decorated with Oreo cookies. Chocolate cupcake with chocolate mousse filling; frosted with white chocolate swiss butter cream, sprinkled with white course sugar, and topped with dark chocolate sticks. Lemon cupcake with lemon filling; frosted in lemon-flavored yellow butter cream and decorated with a small daisy flower. Lemon cupcake filled with seedless raspberry preserve; frosted with fresh whipped cream, then topped with lemon zest and fresh raspberries. Chocolate cupcake filled with marshmallow cream; frosted with dark chocolate glaze. Vanilla cupcake with light, orange creamsicle filling; frosted with fresh whipped cream, sprinkled with orange zest, then topped with a mandarin orange slice. Chocolate cupcake; frosted with peanut butter mousse, dipped in dark chocolate ganache, then drizzled with peanut butter sauce. Pineapple cupcake with pina colada cream filling made with vanilla custard, coconut, fresh pineapple, and a splash (or two) of rum; frosted with cream cheese butter cream, sprinkled with coconut, then topped with a maraschino cherry and cocktail umbrella. Vanilla cupcake with champagne mousse filling and fresh chopped strawberries; frosted with fresh whipped cream and glazed berry slice. Coffee-flavored vanilla cupcake with marscapone cheese and marsalla wine filling; frosted with fresh whipped cream then sprinkled with dark chocolate shavings. Vanilla cupcake with white chocolate mousse filling and fresh raspberries; frosted with white chocolate- swiss butter cream frosting, then decorated with fresh raspberries and sprinkled with white coarse sugar.